I don’t know about you, but Slushies were one of my favorite childhood treats. What’s more fun than a regular slushy? A grown-up version. 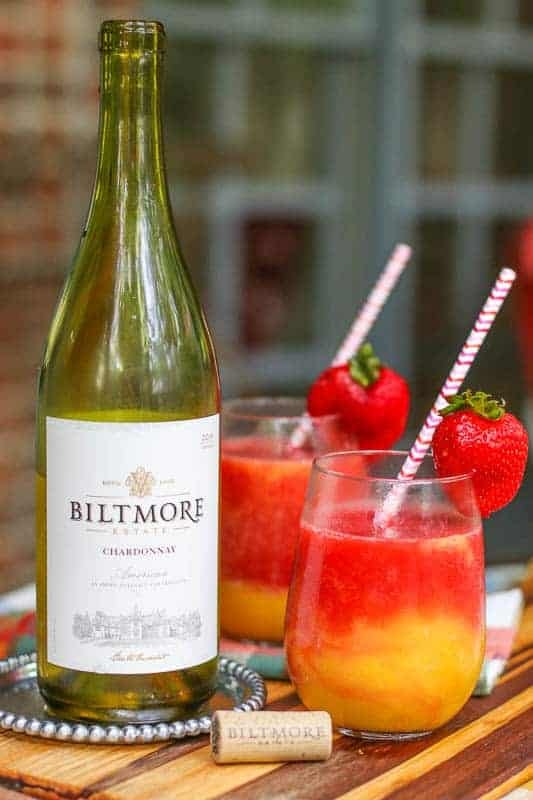 This Blender Strawberry and Mango Wine Slushy is easy to make and easier to drink! If you know me, you know I love wine; aka “Mommy Juice.” There is nothing better than sipping on a great glass of wine at the end of the day to unwind and relax. Last year, Cityview Magazine had me write a “Food & Wine” article. This was my favorite article to write…. because, you know… I got to drink the beer and wine as I developed my recipes…. I created my Slow Cooker Beer Brats with Onions, Port Wine Cheese Ball, and Cheesy Jalapeño Cheddar Cheese Beer Bread. I also created this Wine Slushy Recipe. The Cityview Article was a Fall/Winter article. It was too cold to add the wine slushy recipe to the blog when I wrote it. However, is now around the corner, so it is the perfect time to break out the blender. 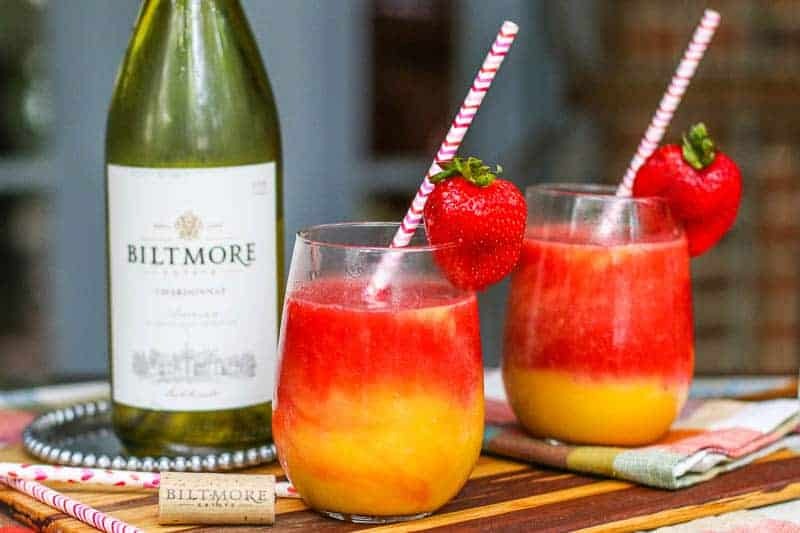 This Blender Strawberry and Mango Wine Slushy makes a beautiful frozen drink. The strawberries and mangos compliment the Chardonnay wine. I personally love the Biltmore Estate Chardonnay. It is a light, smooth, dry white wine. It is a great wine at a very reasonable price, perfect for entertaining. I don’t prefer sweet wine. This isn’t a sweet wine slushy recipe. Because I don’t add sugar to the recipe, the fruit naturally sweetens it up a bit without creating an actual “sweet drink.” If you prefer a sweeter slushy, I would recommend adding sugar or using a sweeter wine such as a riesling. If you like this recipe, check out: Red, White, and Blue Sangria Sparklers and Pomegranate Sangria. I don’t know about you, but Slushies were one of my favorite childhood treats. What’s more fun than a regular slushy? A grown-up version. 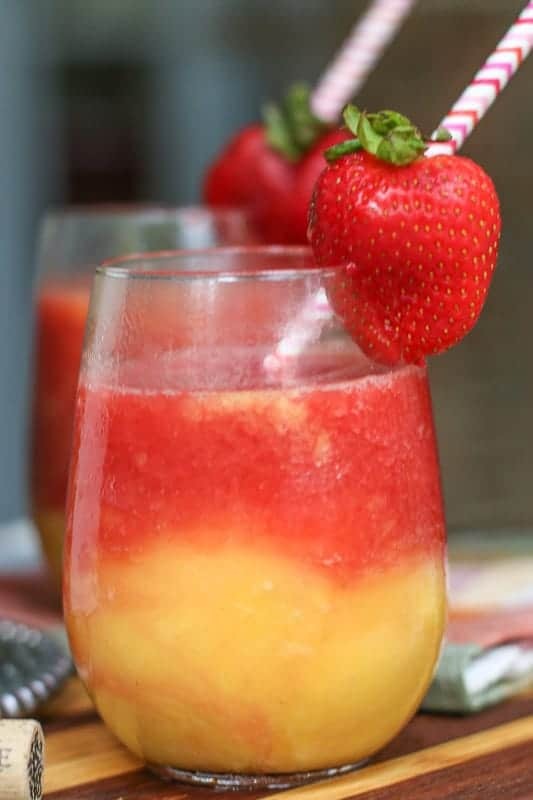 This Blender Strawberry and Mango Wine Slushy is easy to make and easier to drink! Cheers! Pour mixture evenly into two wine glasses. 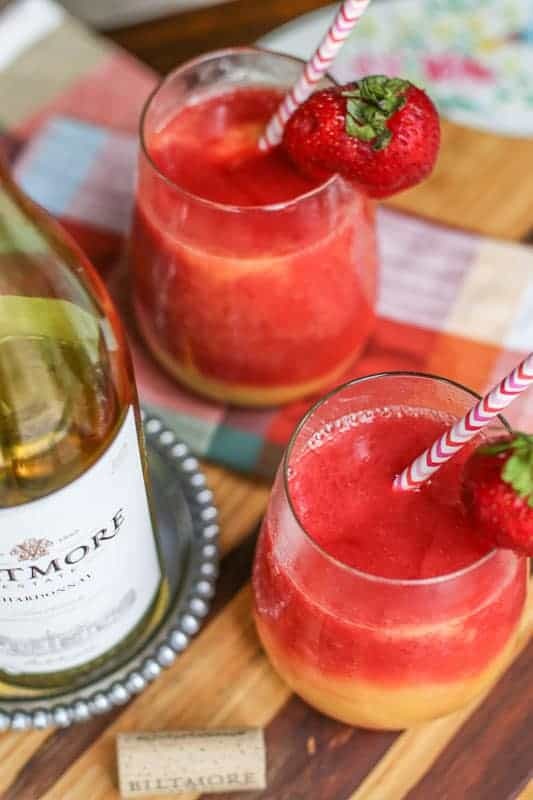 Add frozen strawberries, ½ cup ice cubes, and ¾ cup Chardonnay to blender. Pour evenly over the two mango slushies. OMG!!! I need this slushy for breakfast! Seriously, this recipe is perfect & I’ll be drinking this slushy every weekend because there’s healthy fruit in it. lol!